For more than 100 years, FCHS has partnered with New Jersey schools to bring food and nutrition education to youth, teachers, child nutrition professionals, administrators, and school nurses. We know that, to be successful, a school wellness initiative should be creative, multi-dimensional, affordable, and manageable. As your local authority on school-based wellness programs, FCHS has the tools to help schools develop and implement innovative school wellness policies. Grow Healthy: FCHS' showcase school wellness initiative. 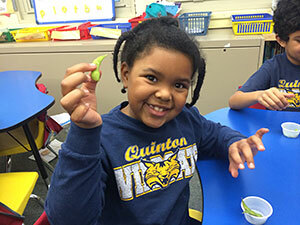 Learn more about this garden-enhanced school wellness initiative for elementary schools. Professional Development/Trainings - FCHS offers professional training and development programs for school administrators, nurses, teachers, and nutrition/foodservice professionals.